On a monthly basis, retail sales increased 0.6% from May to June (seasonally adjusted), and sales are off 9.6% from June 2008 (retail ex food services decreased 10.3%). Excluding autos and gas, retail sales fell again in June. 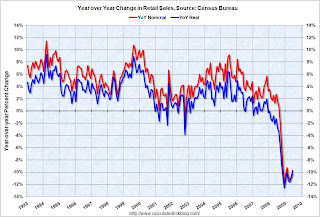 The following graph shows the year-over-year change in nominal and real retail sales since 1993. To calculate the real change, the monthly PCE price index from the BEA was used (June PCE prices were estimated as the average increase over the previous 3 months). The Census Bureau reported that nominal retail sales decreased 10.3% year-over-year (retail and food services decreased 9.6%), and real retail sales declined by 9.7% on a YoY basis. The second graph shows real retail sales (adjusted with PCE) since 1992. 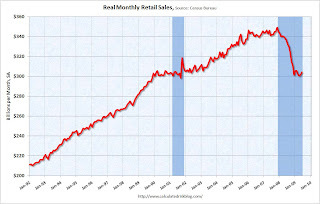 This is monthly retail sales, seasonally adjusted. This shows that retail sales fell off a cliff in late 2008, and may have bottomed - but at a much lower level. The U.S. Census Bureau announced today that advance estimates of U.S. retail and food services sales for June, adjusted for seasonal variation and holiday and trading-day differences, but not for price changes, were $342.1 billion, an increase of 0.6 percent (±0.5%) from the previous month, but 9.0 percent (±0.7%) below June 2008. Total sales for the April through June 2009 period were down 9.6 percent (±0.5%) from the same period a year ago. The April to May 2009 percent change was unrevised from 0.5 percent (±0.3%). Retail trade sales were up 0.8 percent (±0.7%) from May 2009, but 10.0 percent (±0.7%) below last year. Gasoline stations sales were down 31.6 percent (±1.5%) from June 2008 and motor vehicle and parts dealers sales were down 14.1 percent (±2.5%) from last year.